Just me tinkering around with some textures. I’ve been hanging out to try this sort of photoshop treatment for ages but I couldn’t find a site that had any decent textures to use. 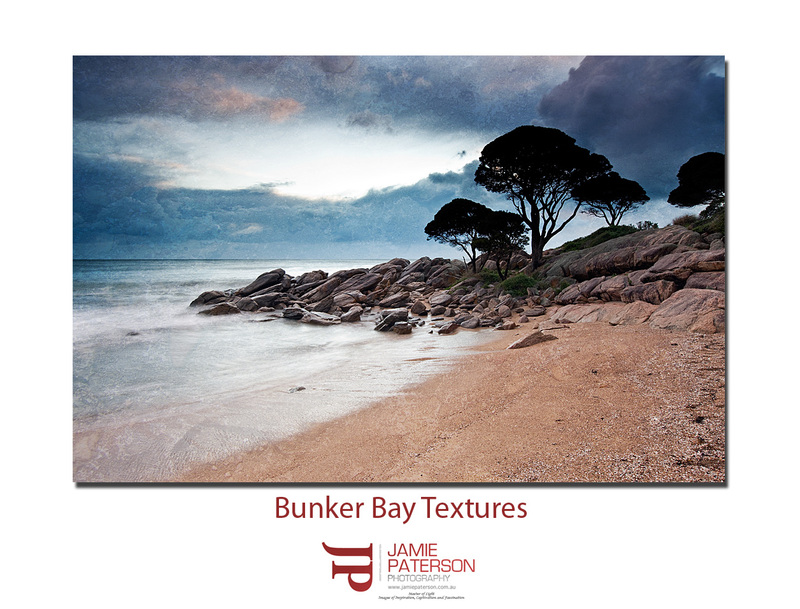 Well thanks to Brent Pearson I’ve finally managed to find a site full of textures that I’m going to use to experiment on my Australian landscape and seascape photographs. Obviously textures don’t suit every photo but its certainly fun to try something different. Have any of you guys experimented with textures in your photos at all? If you haven’t tried it but are curious and want to give it a go, check out Brent’s excellent tutorial on is blog. This entry was posted in Australian Landscapes, Australian Seascapes, sunrise photos and tagged "wide angle lens photography", australia, Australian Landscapes, Australian Seascapes, beach, bunker bay, dunsborough, Jamie Paterson, landscape, long exposure, ocean, photo, seascape, south west, sunrise, yallingup. Thanks for stopping by and commenting. I’m glad you like the processing, its only my first one and obviously I need to play with this technique a little more to get better at it. Thanks for the comment. I’ll be checking out your work in the morning. The jury is out for me on this one. I’m not sure if I like the effect or not (I like the photo though) but happy tinkering! Thanks for the comment. I didn’t expect a standing ovation for this one. 😉 I was just being a typical party animal sitting in front of my computer at 9pm on Saturday night and thought I’d give it a go. I like the photo and don’t mind the texture effect. Thanks for the comment mate. I’m going to experiment more probably with my wave / surf photos. you needed to put your feet up on Saturday night mate after the big night on Friday, hows your eyesight?? Recovered?? How is my eyesight? Huh? Do you mean after what we saw on Friday evening? If that is what you meant then no I’ve not recovered. I can’t believe Michael doesn’t even remember dropping me off. hmmmm…..would love to know what you all got up to on Friday !!!!! Ahhhh not much. Mike dragged Christian and I off to a pub somewhere in Perth. I do like the texture effect, but maybe you can make it more subtle in the sky? Never would I have come up with an idea like this. Thank you for the comment. Next time I will make the texture effect more subtle. I was just playing around with the effects. Glad you found the texture tip useful. Thanks for the link and referral.